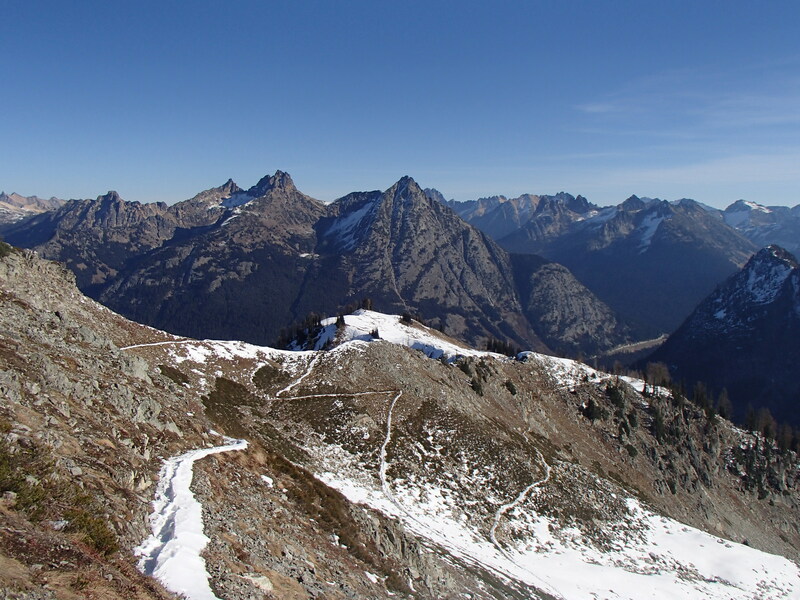 Well, I said these are listed in no particular order, but Maple Pass is, hands down, the area’s premier hike. With two passes and two alpine lakes, this 7 mile loop hike is a must do, and one you’ll do again and again. Alas, it has definitely been discovered, so you won’t be alone on a summer weekend. But just choose to have lunch somewhere other than the pass where everyone else is sitting. The loop starts from the parking lot on the South side of Rainy pass. Heading counter clockwise, the trail goes up (kind of) gradually and back down steeply. After about 1.5 miles of woods walking, there is a short side trail (.5 m) to Lake Ann where you can see the pass towering overhead. Continuing on, the trail soon pops out of the woods and switchbacks up to Heather Pass, then continues onto Maple Pass and then actually continues to climb a bit more to the high point at 7,000 feet. Most people love to stop at the passes, but our favorite spot is actually the alpine meadows after the high point. The wildflowers go crazy here in late summer. After the steep descent, you hit the paved Rainy Lake trail. Turning right will take you a very short distance to Rainy Lake. Turning left will take you back to your car. Driving Directions: From Cascades Outdoor Store in downtown Winthrop, take a left at the stop sign, and follow highway 20 thirty five miles to Rainy Pass. The parking lot is on the left (south) side of the highway.